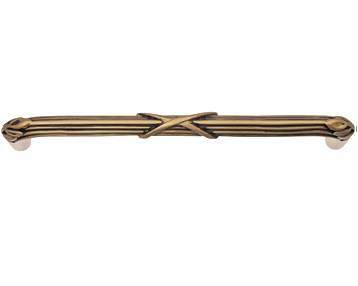 8 3/4 Inch Solid Pewter Sonnet Pull (Antique Brass Gold Finish): measures 8 3/4 inches long and 5/8 inches wide with a projection of 1 3/4 inch. Center to Center spacing of 8 (203.2 mm 8.00 c-c) inches (also comes in a 3, 4, 6 and 12 inch spacing). This item comes complete with the mounting hardware. Shown in a Antique Brass Gold finish. Available finishes include Pewter Matte, Pewter Bright, Satin Pewter, Brushed Pewter, Matte Black, Bronze, Rubbed Bronze, Antique White, Antique Copper, Verdigris, Antique Brass Gold, Iron Red, Rust, Black Terra Cotta and Black Copper Wash.